If you're into casual puzzle games, chances are you've come across one or two match-3 games throughout your journey. Or maybe a few dozen. The fact is, the sheer number of match-3 titles available makes it hard to separate the good from the bad. But we're here to help. What follows is one of the best that the genre has to offer, a fresh and inventive game that simply take a good thing and make it better. If you're looking to waste a whole lot of time, this game will be more than happy to help. We’re talking about an amazing game called Alchemy Master, now available for both Android and iOS users. You will have a chance to experience a multi-level challenging match 3 adventure, stunning design and addictive gameplay. Let’s tell you how the game is played and where can you download it from. Alchemy Master features a classic match 3 gameplay, where the player’s main goal is to match the potions and win scores. 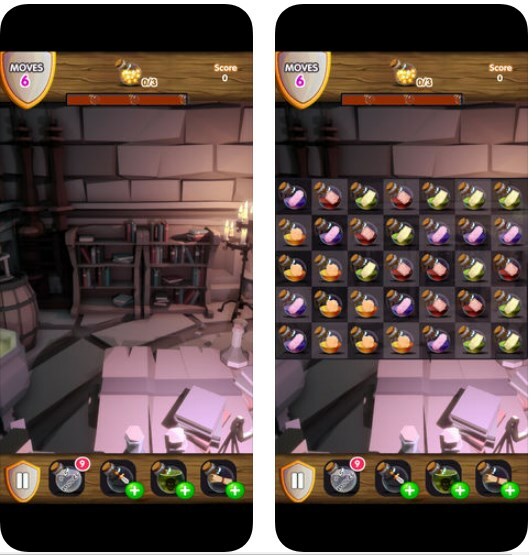 Here, you will have to match 3 or more potions in a row in order to progress to higher levels. You will be able to play alone or to compete against your friends, but don’t forget – you will need smart moves and quick thinking. Watch your moves, win points and as many levels as you can. There are 300+ challenging levels featured in this game, various game modes that will enhance your gaming experience (Target Score, Timed Levels, Collect Drinks, Dirty Sugar Crush, Sugar Bomb, Jelly Cage) and helpful power-ups and boosters (Sweet Blast, Jelly Boost, Juice Splash, Candy Swipe, and Sweet Crush Shovel). Matching more potions will be rewarded with awesome combos, so make sure you show your best match 3 skills! To enjoy this cool puzzle adventure, click one of the links below and get the game for free. Don’t forget to share Alchemy Master with your friends and family.